Uniquifiers: all rows or the duplicate keys only? Some days ago I was talking with my friend Davide Mauri about the uniquifier that SQL Server adds to clustered indexes when they are not declared as UNIQUE. We were not completely sure whether this behaviour applied to duplicate keys only or to all keys, even when unique. Another way to discover the same results would be looking at the output of DBCC PAGE(). Looking at the text output of DBCC PAGE, uniquifiers are displayed as 0 (zero) when the values are not set, but the values are actually missing from the page. If you run the code in the different situations outlined before (unique clustered index, non-unique clustered index with or without duplicate keys) you will find the uniquifiers associated with each duplicate key and you will also notice that no uniquifier is generated for the keys that are unique. Back in 2011 I showed a method to discover the resultset definition of DBCC undocumented commands. At the time, SQL Server 2012 had not been released yet and nothing suggested that the linked server trick could stop working on the new major version. Surprisingly enough it did. -- Set the authentication to "current security context"
The metadata could not be determined because statement 'DBCC LOGINFO();' in procedure 'loginfo' does not support metadata discovery. This behaviour has to do with the way SQL Server 2012 tries to discover metadata at parse/bind time, when the resultset is not available yet for DBCC commands. Fortunately, there is still a way to discover metadata when you have a SQL Server instance of a previous version available. This trick will be particularly useful for an upcoming (and long overdue) post, so… stay tuned! Some months ago I posted a script on a SQLServerCentral forum to help a member automating the execution of DBCC CHECKDB and send and e-mail alert in case a consistency error is found. The original thread can be found here. I noticed that many people are actually using that script and I also got some useful feedback on the code itself, so I decided to write this post to make an enhanced version available to everyone. Your primary responsibility as a DBA is to safeguard your data with backups. I mean intact backups! Keep in mind that when you back up a corrupt database, you will also restore a corrupt database. A task that checks the database integrity should be part of your backup strategy and you should be notified immediately when corruption is found. Unfortunately, the built-in consistency check Maintenance Task does not provide an alerting feature and you have to code it yourself. SQL Server 2000 and above accept the “WITH TABLERESULTS” option for most DBCC commands to output the messages as a result set. Those results can be saved to a table and processed to identify messages generated by corrupt data and raise an alert. If you don’t know how to discover the resultset definition of DBCC CHECKDB WITH TABLERESULTS, I suggest that you take a look at this post. In order to receive an e-mail alert, you can use a SQL Agent job and schedule this script to run every night, or whenever you find appropriate. When invoked with the @log_to_table parameter for the first time, the procedure creates a log table that will be used to store the results. Subsequent executions will append to the table. The web is full of blogs, articles and forums on how to automate DBCC CHECKDB. If your data has any value to you, CHECKDB must be part of your maintenance strategy. Run! Check the last time you performed a successful CHECKDB on your databases NOW! Was it last year? You may be in big trouble. Lots of blog posts and discussion threads suggest piping the output of DBCC commands to a table for further processing. That’s a great idea, but, unfortunately, an irritatingly high number of those posts contains an inaccurate table definition for the command output. The reason behind this widespread inaccuracy is twofold. On one hand the output of many DBCC commands changed over time and versions of SQL Server, and a table that was the perfect fit for the command in SQL Server 2000 is not perfect any more. In this case, the blog/article/thread is simply old, but many people will keep referring to that source assuming that things did not change. On the other hand, the output is not always documented in BOL, and people often have to guess the table definition based on the data returned by the command. I’ve been guilty of this myself and I’ve been corrected many times, until I decided that I needed a better way to discover the output definition. You are a database professional and you don’t like to guess, because guessing is never as good as knowing it for sure. In order to stop guessing, you will have to create a linked server named “loopback” that points back to the same instance where you are running the DBCC command. I am sure you are asking yourself why you need such a strange thing as a loopback linked server. The idea behind is that you need a way to query the command as if it was a table or a view, so that it can be used as a valid source for a SELECT…INTO statement. The perfect tool for this kind of task is the OPENQUERY command, which allows sending pass-through queries, that don’t necessarily need to be SELECT statements. 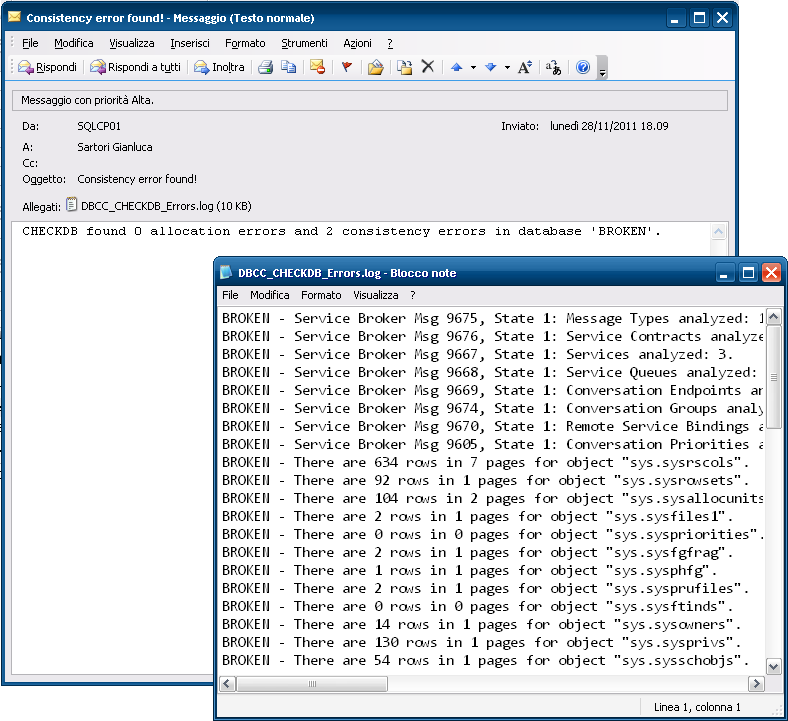 OPENQUERY requires a linked server, which can be any OLEDB data source, including a remote server or the same SQL Server instance where the linked server lies. In order to capture the output of DBCC commands, you have to wrap them inside a stored procedure, otherwise SQL Server could complain about missing column information. I don’t know the exact technical reason behind this error (I suppose it has to do with the way metadata is propagated), but this limitation can be overcome wrapping the command into a stored procedure and using “SET FMTONLY OFF” in the pass-through query. This is also a nice way to overcome the single INSERT…EXEC limit (and implement many more interesting tricks that I hope to cover in future posts). 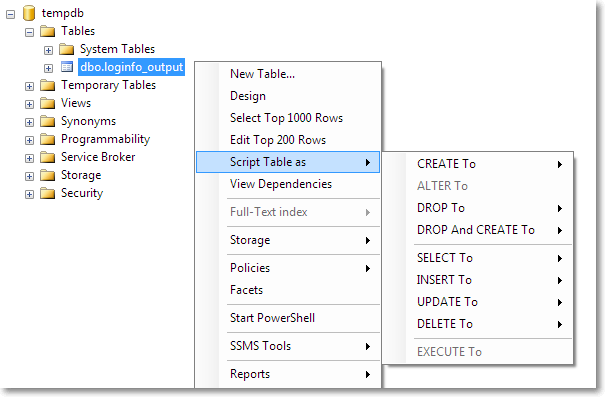 Running this script will create a table named “loginfo_output” in the tempdb database: you can find it in your object explorer and script it out to a new query editor window. Repeating these steps on instances running different versions on SQL Server reveals that the table definition changed in SQL2005 and then remained the same in 2008 and 2008R2. You could ask with good reason why you should use an output table when you could query the wrapper stored procedure directly with OPENQUERY. Based on observation, the trick does not always work and SQL Server can randomly complain about missing column information. Cannot process the object "loginfo". The OLE DB provider "SQLNCLI10" for linked server "LOOPBACK" indicates that either the object has no columns or the current user does not have permissions on that object. Again, I don’t have an in-depth technical answer: I can only report what I observed. It’s not a big deal indeed, because the output definition changes very slowly (typically between SQL Server versions) and you probably would review your code anyway when upgrading to a newer version. I guess you can live with a hardcoded table definition when the price to pay for having it dynamic is a random failure. This post showed you how to capture the output of DBCC LOGINFO, but the same technique can be used for all DBCC commands that allow specifying WITH TABLERESULTS, extended stored procedures, remote stored procedures and all those programmable objects than cannot be inspected easily. Now that you have the right tool in your hands, do yourself a favour: stop guessing!